Enjoy this 3 bedroom, 3 full bath townhome. This property includes a kitchen/dining/great room, 2 master bedroom suites, bunk room that sleeps 4 kids, and a deck and hot tub on the main level. Comfortable sleeping accommodations for 8 are provided with 2 kings, 1 queen pull out, 2 sets of twin bunks, and 1 futon bed. In the great room, relax next to the gas burning fireplace and the collection of games and books. On the private deck, sunbathe and barbeque while enjoying a game of Bocce Ball, or soak in the hot tub under the starry sky. Brand new 40' lcd tv and 5 person hottub, and wifi. 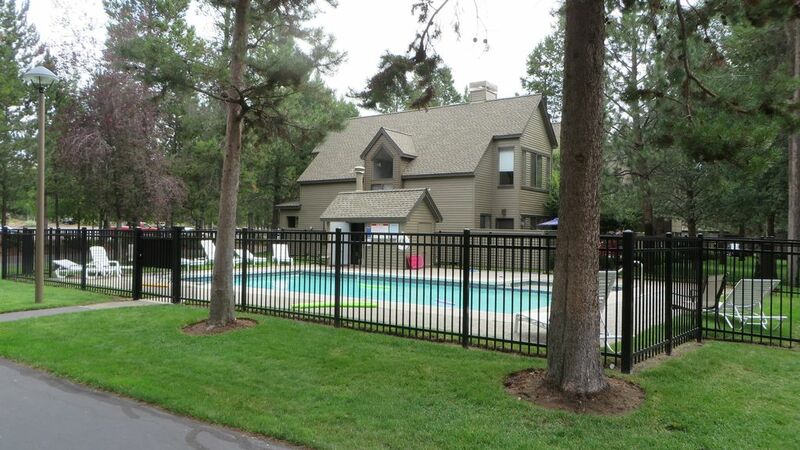 Located adjacent to the Woodlands Golf Course and the north tennis courts. You will be near many recreational activities. The townhome is a close bike ride to Benham Falls and Fort Rock Park/Tennis Hill. We provide private lounge chairs for the pool, 5 bikes, and a Bocce Ball set. McDivot's Snack Bar is located at Woodlands Golf Course and serves breakfast, lunch and snacks in season. The North Store is just two miles away for groceries and movie rentals. Explore the many miles of biking and running trails. You’ll be close to the Deschutes River for rafting, canoeing and fishing at nearby lakes. The Sage Springs Spa provides both a gym to workout and a spa to soothe muscles. Shop at the Sunriver Mall and enjoy many of Sunriver's restaurants. In the summer months, enjoy horseback riding at the stables, “glowball” mini golf or outdoor summer concerts. Sunriver has several children and teen programs available. Kids of all ages will enjoy everything Sunriver has to offer. In the winter, nearby Mt. Bachelor offers skiing, snowboarding and snowmobiling. Entertainment features include 4 TVs, DVD Plalyer and a CD stereo. The kitchen includes a range, oven, dishwasher, microwave and all utensils necessary for preparing fine meals. The dining area comfortably seats 6, with 4 more at the breakfast bar, and place settings for 12. Parking is provided for 2 cars, including 1 in the garage. Start your vacation with a dip in the pool, and finish it without any housekeeping! Pool Open Memorial Day thru Labor Day. rentals nearby at the Sunriver Marina. right next to Woodland Golf Course, just a short walk away. Great condo with two master bdrm. Fun family time. Spacious, comfortable and well supplied kitchen. TV worked great for the ballgames. Microwave was dirty. The snow was beautiful but the sheet of ice on driveway and up to house very dangerous. Dust and cobwebs a problem. Grease in many pots and dishes not washed. Someone’s clothes left in drawers. Sheets and blankets just thrown in closets. We would love to rent again if cleaned better. Great place to hangout with family. We really enjoyed our long weekend. We even had snow and do it seemed perfect. The owners were thorough about setting up the place, and keep it clean, as well as user friendly! We will use this place again if we come this way! Thanks! The place had a lot of space and great amenities, but it could really use a deep cleaning. The carpet was coming up in one of the bedrooms and two chairs with the dining room set were on the verge of coming apart or loose and need to be replaced. New flooring / carpet could really improve this place. Nice space - perfect for a place to stay when skiing - nice location - quiet and peaceful. Extra parking close to condo good for large ski vehicle. Thanks, so glad you had a great time! PLEASE NO PETS OR SMOKING! 100% REFUND FOR CANCELLATION PRIOR TO 60 DAYS BEFORE SCHEDULED ARRIVAL EXCEPT FOR A $50 CANCELLATION FEE. CANCELLATION WITHIN 60 DAYS OF SCHEDULED ARRIVAL, ALL PAYMENTS ARE FORFEITED.